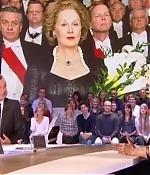 Meryl’s interview on the French talkshow Le Grand Journal has been added to the video archive. Her segment is short but funny, especially the card trick. Additionally, find captures from the interview in the image library.